Deep-Fried Soft Shell Crabs and Kingfishers Pizza! Now that we’re in the middle of soft shell crab season we should be thinking about frying up a few of these fabulous crustaceans. 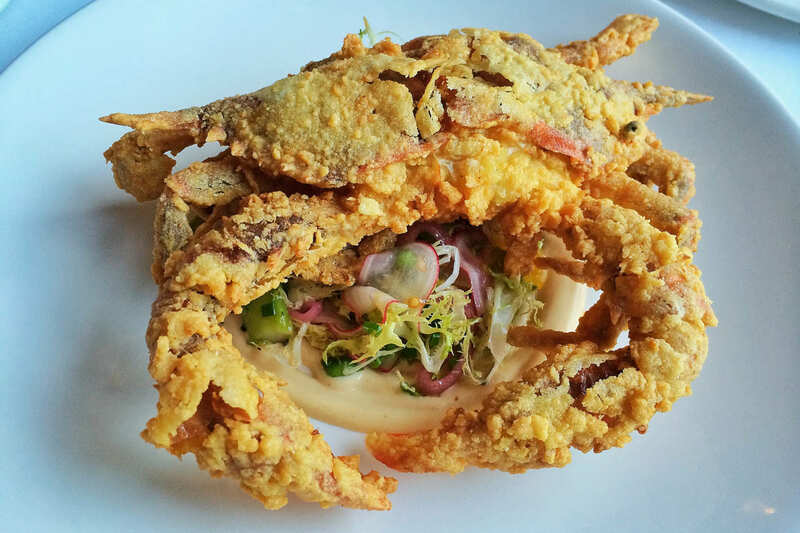 The soft shell crab is one of the South’s greatest contributions to American cuisine. Soft shells are a delicacy in every sense of the word. They can be sautéed or deep fried. A soft shell is a common blue crab that’s harvested during the early stages of molting, when the crab sheds its smaller shell and before a new, larger shell forms. The crab should be cooked before the new shell begins to harden. A bit of pre-cooking preparation needs to be done. The crab needs to be cleaned. 1. To clean soft-shell crabs, hold the crab in one hand, and using a pair of kitchen shears, cut off the mouth and eye parts. 2. Lift one pointed end of the crab’s outer shell; remove the gills by pulling them out. Repeat on the other side. 3. Turn the crab over and pull off the small flap known as the apron. Rinse the entire crab well and pat dry. Once cleaned, crabs should be cooked immediately. Only buy crabs that are alive. If they don’t move when touched, they’re dead and you won’t know when they expired. Smell the crabs. Like other seafood, soft shells should odorless or smell like the ocean. Avoid buying frozen crabs as they lose most of their body fluid when they thaw out and appendages tend to break off. Soft shells should only be consumed during the season, which varies with the latitude. Soft shells are great with French fries and coleslaw or as a po’ boy sandwich. Any po’ boy should be made on a crunchy French baguette. The po’ boy can be dressed with lettuce, tomato and tartar sauce. 2-3 cups frying oil, or as needed depending upon the size of pan. Combine the flour, salt, pepper and Old Bay. Whisk together the milk and eggs to make egg wash. To coat the crabs, dredge them thoroughly in seasoned flour, then dip in egg wash and back into the flour mixture. The crab is now ready for frying. Heat the frying oil to 350ºF in a sauté pan. Carefully place the crabs into the hot oil. Cook for at least 2 minutes, or until golden brown on one side. With tongs, carefully turn over and cook until golden on the other side. When crabs fry they tend to explode splashing oil on anyone standing nearby so cover with a frying screen or hold a lid a few inches over the pan. Drain on paper towel. Serve hot while they are still crispy. Once cream cheese has softened completely, add all ingredients except crab meat and shredded cheddar jack into a mixing bowl and mix well until all ingredients are mixed accordingly. Take the 2 flat breads or pre-baked pizza dough and gently spread the cream cheese mixture evenly on top. 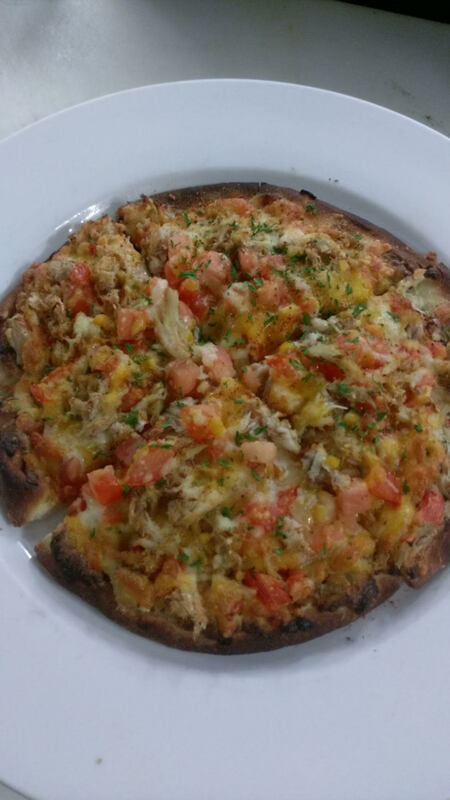 Take the crab meat and spread evenly on both pizzas. Spread shredded cheddar jack over crabmeat and top with diced tomatoes. Bake in a 350 oven until cheese is melted and lightly browned. Keep an eye on the crust to make sure it does not burn. Safely remove from oven and sprinkle some more Old Bay seasoning and some fresh parsley.